The sand pit on One Tree Hill showing a fine section through the Bagshot Sand. The photograph was taken in 1907. Photo © British Geological Survey (P252671). 50 million years ago during the Eocene period. Above the London Clay is the Claygate Beds, sandy clay laid down as the London Clay Sea became shallower and the coastline came nearer. The London Clay and Claygate Beds both contain fossils of animals that lived in this sea. The Claygate Beds, in turn, are overlain by beds of almost pure sand called the Bagshot Sand, which was laid down as this ancient sea became even shallower. This delightful, yellow sand therefore represents an ancient shoreline during the Eocene period. 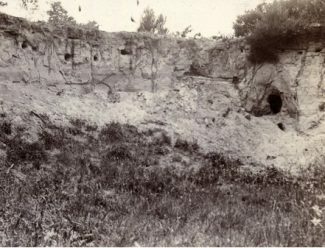 Intense erosion by rivers during the Ice Age has considerably modified the landscape, carving valleys but leaving outcrops of Bagshot Sand on the high ground. This pattern is typical of many of the hill tops in south Essex, but the Langdon Hills is the best example. The London Clay, Claygate Beds and Bagshot Sand are therefore the ‘bedrock’ geology but on the very top of the Langdon Hills is a patch of gravel, commonly called pebble gravel, which is clearly much younger and of a different origin. This gravel was for years thought to have been laid down under a sea but it is now thought that it may have been deposited by a river. But how could river gravel be capping the top of the Langdon Hills? For many geologists the riddle of the pebble gravel has now been solved by studying the pebbles it contains. Although mostly of flint, a small proportion are distinctive pebbles of chert from the Lower Greensand of The Weald, and other rock types that could only have been deposited by a river flowing from the south. Similar gravels are found capping the high ground in Epping Forest and the Rayleigh Hills. These isolated outcrops of gravel date from the early part of the Ice Age (the Pleistocene epoch), perhaps as much as a million years ago, and were probably laid down by northward-flowing tributaries of the Thames. This was when the Thames flowed across north Essex and Suffolk before its diversion to its present course by the Anglian ice sheet 450,000 years ago. It is difficult to believe that this gravel may originally have been the floor of an ancient river valley. Curiously this gravel may even be the reason the Langdon Hills are here, the gravel protecting this part of Essex while the surrounding land was reduced to the present lowland by hundreds of thousands of years of erosion.